Throughout the history of pharmacology the exploration of antagonism and the use of antagonists has played an important role both in the development of theoretical concepts and interpretations and in experimental practice. The use of antagonists to interfere with the physiological or pathological effects of endogenous mediators forms an important branch of rational drug therapy. The first synthesis of a peptide hormone — oxytocin — by du Vigneaud and his coworkers (1953) opened the way to structurally modified synthetic hormone analogues including, it was reasonable to hope, antagonists of the natural hormones. 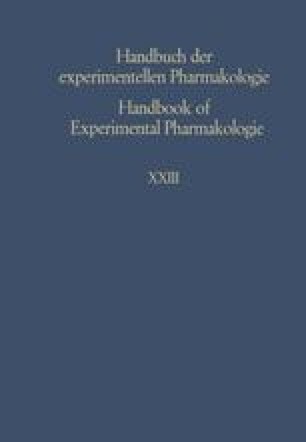 Moreover, synthesis made available unexceptionably homogeneous preparations of the individual hormones, thereby eliminated some of the uncertainties attaching to much of the earlier work with materials purified from natural sources, and in consequence stimulated extensive physiological and pharmacological studies including work on antagonism.